Late submissions happen, for whatever reason an entry isn’t able to make it in time for the deadline. 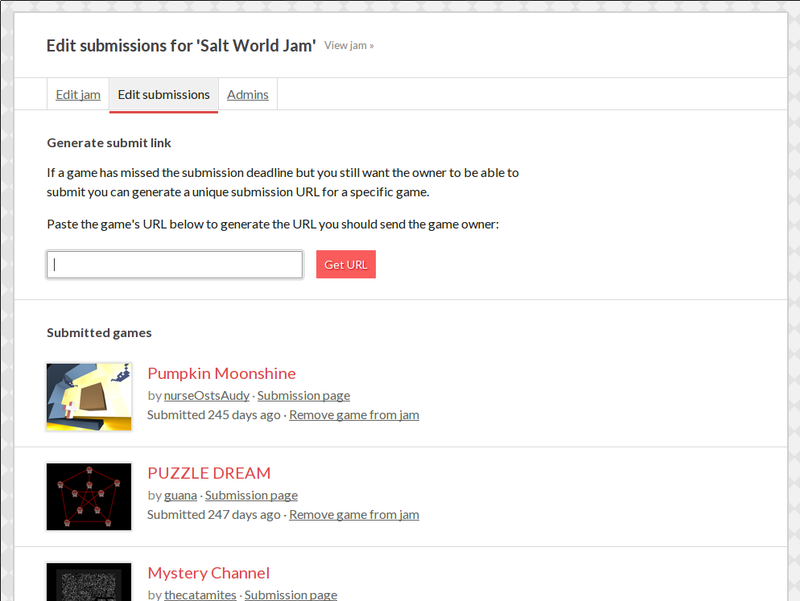 Luckily itch.io’s jam feature now lets owners of a jam handle this with ease. From the submissions tab you can find the late submission form. Just paste the URL of the game you want to have late submit access, you’ll then be given a URL to share with the game’s owner. They just need to visit that URL to submit their game, even if the submit deadline is over! Jam admins now have their own list of entries from the edit page. From this list you can get a quick glance of everything that’s submitted. Additionally you have the ability to remove entries if they aren’t eligible for being part of the jam.